After a suspenseful night waiting for a signal from the ExoMars Schiaparelli lander, the European Space Agency (ESA) confirmed today that the spacecraft went silent less than a minute before it was set to reach the Martian surface Wednesday (Oct. 19). ESA mission managers said this morning (Oct. 20) that they need more time to understand what went wrong with Schiaparelli, and to figure out exactly where and in what condition the test lander ended up. But the ExoMars team was optimistic that the capsule had collected enough data during its descent to set the stage for the next phase of the mission: the planned 2020 launch of a life-hunting ExoMars rover. 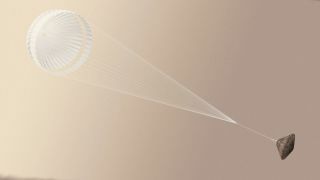 An artist's illustration of the European Space Agency's Schiaparelli Mars lander parachuting down to the surface during its Oct. 19, 2016 descent. Schiaparelli was scheduled to touch down on the Red Planet Wednesday at 10:48 a.m. EDT (1448 GMT). But the spacecraft's handlers could not confirm a successful landing, and were left waiting on a signal. Meanwhile, Schiaparelli's mother ship, the Trace Gas Orbiter (TGO), successfully entered orbit around Mars. Schiaparelli had been programmed to follow a demanding 6-minute landing sequence that would see the capsule come to a halt from about 13,000 mph (21,000 km/h). The first phases of this sequence went according to plan, Andrea Accomazzo, head of ESA's solar and planetary missions, said at the news conference from ESA's operations center in Darmstadt, Germany. The lander sailed through the upper layers of the Martian atmosphere as expected, and its supersonic parachute deployed on time — important indications that "the heat shield has worked flawlessly," Accomazzo said. But the ejection of the back heat shield and parachute occurred earlier than planned, he added. "Following this phase, the lander has definitely not behaved exactly as we expected," Accomazzo said. As to whether Schiaparelli is still in one piece, "It's very difficult to say a likelihood now," Accomazzo said. "We are not in a position yet — but we will be — to determine the dynamic conditions with which the lander has touched the ground, and then we will know whether it could have survived structurally or not," Accomazzo said. "We are still processing the data from the descent. From the surface, we have no data at all." This European Space Agency graphic depicts the different stages for the Mars landing by the Schiaparelli module during the ExoMars 2016 mission. He added that it might take some time for the team to locate the lander physically on the ground using imagery from an orbiter such as NASA's Mars Reconnaissance Orbiter. "The very good news is that TGO is very successfully inserted into the orbit," said Jan Wörner, director general of ESA. "That means that TGO is now ready for science and, at the same time, ready for data relay, which we need for the 2020 mission." Wörner said that after another review of the 2020 mission next week, ESA officials will know exactly how much they will have to ask each of the agency's member states to contribute to complete the funding for ExoMars. (The total amount of extra funding needed is on the order of 300 million euros, or about $329 million.) He and other ESA officials expressed confidence that Schiaparelli's bumpy finish wouldn't derail the next phase of the mission. "All the key pieces of hardware were activated and provided data," Parker said. "The experience feeds into the next mission exactly as planned."